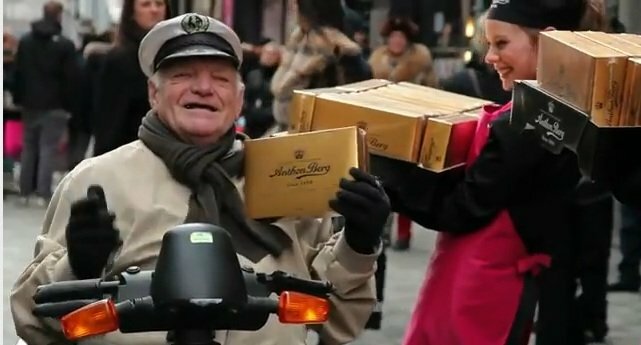 Anthon Berg’s brand tagline: You can never be too generous. That’s a brilliant message for a high-end chocolate-maker seeking to differentiate itself from “every day” chocolate. This is the chocolate good enough to gift. The pop-up Generous Store was a one-day event in February, the month of Valentinsdag. Everything I can find says the Danes celebrate V-day just like we Americans – on February 14. Anthon Berg’s pop-up Generous Store opened-and-closed its doors on February 25. As a cynic, I expect this has something to do with giveaway containment. And as an incurably romantic marketer, I hope it also has something to do with spurring genuinely generous behavior. And speaking of romance – let’s look at those good deeds suggested as price tags in the Generous Store. Lots of nice things for girlfriends, wives and mothers. Perhaps there was a section full of nice deeds for boyfriends, husbands and fathers. But I bet there weren’t many acts of chocolatey-generosity slated for strangers. These are good deeds for loved ones – meant to create lots of joyous, memorable conversations that built lasting associations between loved ones, goodness and the Anthon Berg brand. This case-study video from RBLM offers some delicious metrics on the Generous Store promotion – and that was before they won a Bronze Lion for Viral Marketing at the Cannes Lions International Festival of Creativity, a Danish Internet Award and a few other sure-to-make-it-go-viral industry accolades. Can your organization do something selfless – all the while underscoring the benefits of your brand? Can you refine the promotion so that every element points back in some way to your product? And can you make the public good truly public by incorporating social media or some other highly consumable broadcast medium? Call it the gift that keeps on giving.